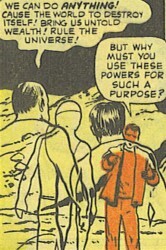 Powers/Abilities: After being mutated by the radiation from a nuclear explosion, the once-human Supermen were transformed into beings of pure intellect with ethereal, ghost-like forms. Along with telekinesis, they seemed to have some degree of telepathy (see comments). History: (World of Fantasy#15/6 (fb) - BTS) - Five international criminals hid out on an uncharted island -- they knew that if they were ever caught, they could be imprisoned for life by the law of any country. Two months later, a U.S. military team visited the island to do a survey and make sure it was uninhabited, and an H-bomb test was scheduled -- since the criminals lived deep within a cave, they were not found. The bomb was detonated, and the intense radioactivity changed environmental factors on the island so drastically that human evolution was accelerated to the Nth degree -- the criminals became a new breed of men, endowed with powers and abilities far beyond those of mortal men. (World of Fantasy#15/6) - A schooner was sailing near the island. For their own amusement, the Supermen took remote control of the vessel and set it on a course towards their island, while the crew was helpless to do anything. When the schooner reached the island, Captain Yates and his men went ashore to investigate. 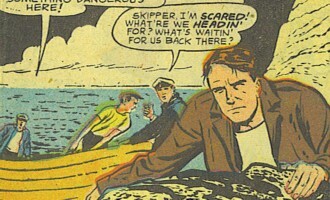 They were eventually ordered by a disembodied voice to proceed along the beach, where they met the five mutated criminals. The Supermen boasted of their power, but then simply let Yates and his men leave. The sailors made a hasty retreat and returned to their boat. 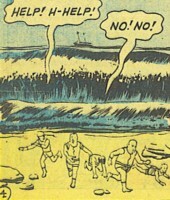 They began to sail away, but were suspicious of the Supermen's true intentions; their suspicions were proven valid when the Supermen created a giant whirlpool to destroy the schooner. As they headed towards certain death, Yates knew that only a miracle could save them... but they suddenly got that miracle when a huge crest of water threw the schooner back away from the vortex -- the tidal wave continued onwards to the Supermen's island, which finally sank. As they sailed off, Captain Yates credited "the inexplicable, uncontrollable force of Nature" for ending the threat of the Supermen. Comments:Created by an unknown writer and Sam Kweskin. I'm only guessing at the location of the Supermen's island -- although some offshore U.S. nuclear tests did take place in the Atlantic Ocean from 1945-1992, the majority of them took place in the South Pacific. I'm guessing that the Supermen's lifeforces were somehow tied to that island -- otherwise, why not just fly off and leave it when it sank? Not having any vocal cords, the Supermen probably "spoke" with mental telepathy. The final fate of the Supermen is unknown, but since they were incorporeal beings -- and therefore would not require air -- I guess they could still be "alive" on the remnants of their sunken island on the sea floor. While sailing near an uncharted island, they suddenly lost control of their schooner, as the boat seemingly sailed itself towards the island. Yates and his men later went ashore and encountered five mutated criminals, who were behind their interrupted journey.